“Live in Art:” this is the motto of Atena Design. For its founder, art plays a constructive role in life, especially if it is not limited to purely intellectual activity or visits to exhibitions. Art, as much as possible, must be part of our daily life. The renovation of Frédéric’s home was done with this concept in mind, seeking to preserve its primary function as a place for family life, and especially to avoid turning it into a museum. Following the opening of Atena Design’s online gallery, the project was enhanced by the transformation of the home’s basement and a part of the garden into new spaces for the collection. Located in Le Vésinet, just outside of Paris, the entire house is now open for visits that are gladly given upon request. It is available to welcome those who want to see a piece “live” in his home or for those who want to see the entire collection, be inspired by the décor, meet Frédéric and share a moment together. In the near future, Frédéric would also love to see his home gallery become a place for artistic events. Mobilier, luminaires, objets d’art : chaque pièce authentiquement vintage est choisie avec soin pour son originalité, son caractère, son esthétisme et la qualité de ses matériaux et de sa fabrication. Pour Frédéric, chaque pièce doit être emblématique d’une époque pleine de vie et d’audace où les designers cherchaient à stimuler les rêves en jouant avec les couleurs et les courbes. Dans la collection Atena Design, Frédéric accompagne ses pièces dans un cycle de vie où chaque étape a son importance : la découverte de l’objet, l’émotion qu’il suscite, le plaisir de lui redonner vie, de le restaurer si nécessaire, de lui trouver une place dans sa maison, de le voir « vivre », puis la rencontre avec son nouvel acquéreur. De la vie, un lieu d’exception, des rencontres… et le concept « live in art » prend tout son sens avec l’ouverture de sa « galerie d’hôtes ». 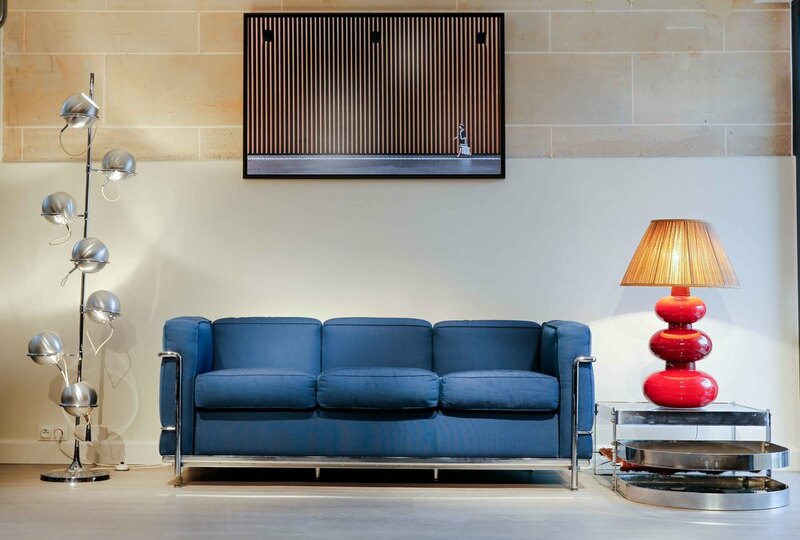 Furniture, lighting, pieces of art: each piece is authentically vintage and is selected with care for its originality, character, aesthetic, and the quality of its materials and manufacturing. For Frédéric, each piece must be emblematic of a revolutionary period of style where designers sought to ignite the imagination by playing with colors and lines. Frédéric accompanies each of his acquisitions through its “life cycle,” where each step has its own importance. First the discovery of the object, the emotion it brings with it, the pleasure of bringing it back to life, restoring it if necessary, finding it a place in his home, watching it come back to life, and then finally, meeting its new caretaker. Life. An exceptional location. Encounters. And the concept of “Live in art” takes on its fullest sense with the opening of his home gallery.